The Construction Management and Technology (CMAT) program researches innovative construction technologies and processes for the transportation industry. Applied research is used to enhance construction transportation projects and disseminate knowledge through appropriate venues. 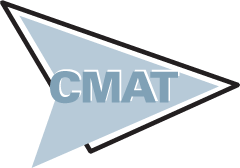 CMAT is also home to a program that offers assistance to disadvantaged business enterprises. Research project ideas are generated and funded by a consortia of industry, state, and federal organizations to meet their specific needs. CMAT, a program within the Institute for Transportation (InTrans) at Iowa State University (ISU), works in cooperation with other InTrans groups. Among them are the Bridge Engineering Center, the Center for Earthworks Engineering Research, and the National Concrete Pavement Technology Center, as well as outside organizations.